IT IS TIME! Crocktober is here! If you've been following me on any of my social medias, you will know that I have been in full on crockpot mode. Why you ask? That would be because October is all about simple and delicious crockpot meals! I am deeming it CROCKTOBER! Full disclosure, it's no secret that I'm not usually a fan of food made in a crockpot, but I have strived to bring you #KitchenWifeApproved meals that are AMAZING! 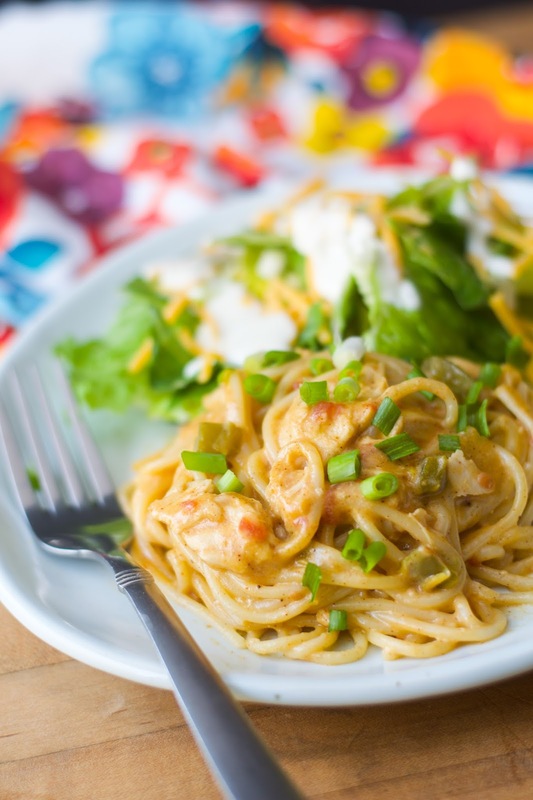 First up, this mouthwatering Crockpot Chicken Spaghetti Recipe. To begin you will need to prepare the Velveeta cheese and vegetables. Next combine the cans of soup, diced tomatoes, and taco seasoning into a mixing bowl. Something that I have recently discovered that has been game changer for me is the Reynolds Kitchens Slow Cooker Liners. I HIGHLY recommend them. They make clean up a breeze! Once you have lined your crockpot with the Reynolds liner, place the chicken on the bottom pour over the sauce mixture. Sprinkle the diced green pepper and onion over everything. After that, add the cheese. Now place the lid on your crockpot, set the temperature to LOW, and cook for 4 hours. It is America's Test Kitchen's number one pick, and I LOVE IT!!! After four hours you will need to remove the chicken from the crockpot and give the sauce a nice stir. This will help any bits of cheese fishing melting and give your smooth sauce. Now you can cook your spaghetti. Simple follow the directions on the box. Shred or dice the chicken. Return it to the crockpot. Stir everything together and you are ready to go! This Crockpot Chicken Spaghetti Recipe is perfect for these cooler, autumn, nights we are transitioning into. It is warm, hearty, comforting, everything you want in a crockpot meal. The taste though, this is literally one of the best meals I have had in a long, long, time! I served it with a nice, crisp, salad to help cut through the richness. I know you are going to love this one, so get in the kitchen and give it a try TONIGHT! And if you make this, or any of my other crockpot recipes this month, be sure to tag me and use the hashtag #CrocktoberwithTheKitchenWife ! 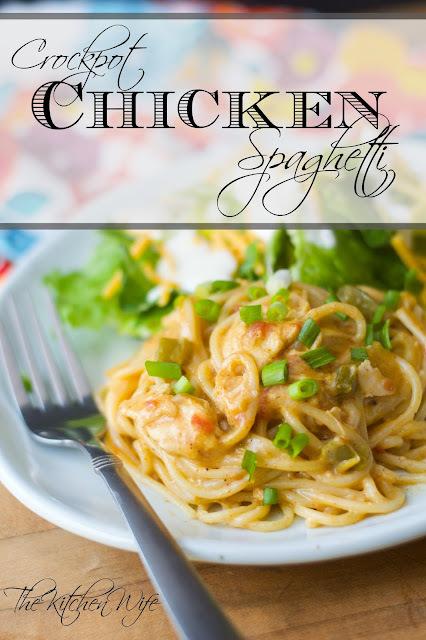 A recipe that the whole family will enjoy, this Crockpot Chicken Spaghetti is super quick and easy to make! Check it out! In a mixing bowl, combine the cans of soup, diced tomatoes with chilies, and taco seasoning. Place the chicken into the bottom of the crockpot and pour over the sauce mixture. Add the diced green pepper and onion. 20 minutes before serving, prepare the spaghetti. Remove the chicken from the crockpot and dice. Return the chicken to the pot and add the cooked spaghetti. This looks delicious. I have made chicken spaghetti from the Pioneer Woman recipe and love it, yours looks so easy & convenient. Will be making your recipe next time we have it! Thanks. Thanks Pam! This was delicious, and I loved how easy it was. Let me know how it turns out and be sure to tag me in a pic using the hashtag #CrocktoberwithTheKitchenWife!